Running burns out more calories than nearly any other exercise out there. The average man burns 124 calories per mile and the average woman burns 105, which makes running an extremely efficient way to lose weight. But it doesn’t always work the way you’d hope. Unwanted weight gain can happen to even the most health-savvy runner, specially if you don’t pay attention to the small details. Runners tend to overcompensate for the calories burned during their runs. This is actually a very common mistake and some runners even find that they gain weight, despite their training efforts. If you want to stay healthy and lose weight by running, you must first determine how many calories you need and keep in mind that you’ll only shed pounds if you burn more calories than you consume. To get a better estimate of how many calories you burn during your workout, you can use our running apps, or an online calculator, like Runner’s World’s Calories Burn Calculator. Even tough runners have special nutritional needs, all the ground rules of healthy eating still apply. So, bad news, runners: you can’t just put that chocolate-covered donut in your mouth after your run. The healthiest way to lose weight while replenishing your energy stores is to combine the right amount of carbohydrates, protein and healthy fats. You should also choose smaller portions over big meals and start eating more whole grains, fruits, and vegetables. One efficient way to prevent you from consuming too many calories is to keep a daily log of what you eat. It’s much easier to improve your diet and eliminate certain foods from it when you have a record of how many calories they add to your total intake. In fact, a recent study funded by the National Institutes of Health showed that participants who kept a food log doubled their weight loss. Have you ever heard that your body will burn more fat it you run on an empty stomach? If you did, forget it. Instead of burning fat immediately, your body uses the carbs stored in your muscles first. When those run out and your body starts to burn fat, your energy levels decrease abruptly, forcing you to slow down and burn fewer calories than if you had properly fueled up. To avoid feeling exhausted after a few miles, you should fuel your training for optimal performance. Try eating a 150-calorie snack containing easily digestible carbs and a little protein one hour before your workout. There’s no doubt: the more miles you run, the more calories you burn. According to the National Runners Health Study, runners who ran the greatest amount of weekly mileage were the leanest. Therefore, if you want to lose weight while running, you need to extend your runs every week. In addition to logging more miles, you should be increasing intensity as well, which can translate in incorporating more speed work or interval training into your running routine. These workouts increase your muscle mass and improve your resting metabolism, causing you to burn more calories throughout the day. Is running helping you to lose weight? 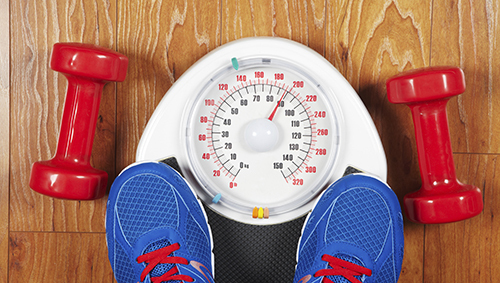 What other weight loss strategies worked for you? Share them in the comments below.